Las Vegas Review-Journal © Jun. 21 at 12:21 p.m. The last word: What are the odds? 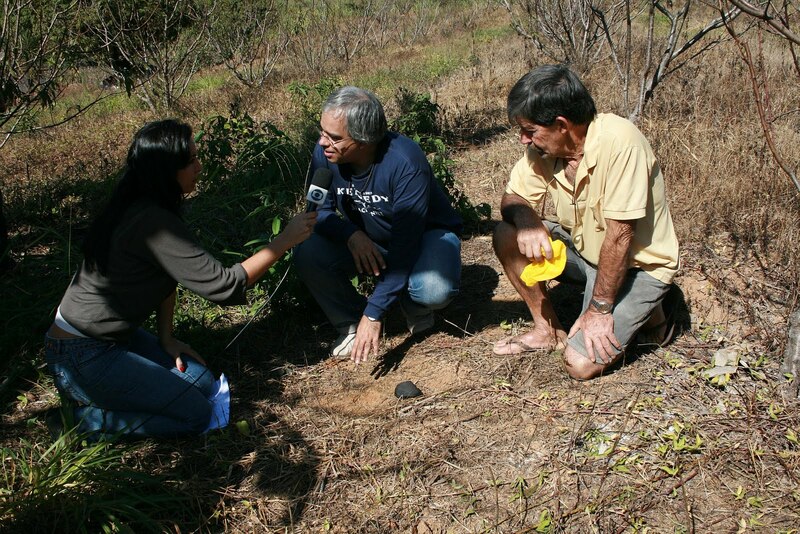 TV News produced by Record with informations of a Meteorite fall in the city of Varre-Sai, Rio de Janeiro State, Brazil, on June 19th 2010. Reportagem produzida pela TV Record sobre o Meteorito encontrado no município de Varre-Sai, região Noroeste do Estado do Rio de Janeiro, em 19 de junho de 2010. Hello. We (Myself, my son and a friend) witnessed this large fireball go over our house in Alexandria Virginia last night around 10 ish. We did not get videos.. at first we thought it was some kind of fire works but it was too big and moved very fast. It seemed to move from east to north west. We checked the local news but no reports. I can't believe more people did not see this. I saw a meteor come into our atmosphere last night at approximately 10:30pm. I saw which direction it went from my vantage point in Point of Rocks, MD. It was quite large actually and a little scary looking. It was green and then went to orange and red. Pennslyvania Meteor/ite We Need Videos to Find Rocks! Please anyone in the MD, Penn, area please check for videos from security companies and shops. If you find video of the event please contact me: drtanuki@gmail.com Thank you! Meteor Sounded Like Frying Bacon! I had the best meteorite experience in my life today at 9:58 pm. I saw a huge fireball for about 5 seconds. I was in Williamsport, MD. It came from the SE and headed NW. My first thought was who is shining a spotlight in the field? I then looked right, and in the second that I looked right I heard a loud boom, and sizzle like bacon. The boom was so loud that it made me jump! I saw stones shedding off this. I saw yellow , green, and white. I saw the dark flight for a second or so; it was like white pin dots. I did some research and it seems to been the brightest in White Hall, MD; maybe PA. I think I am less than 100 miles from the strewnfield. Meteor during Thursday's Orioles game? Reportagem da InterTv sobre o Meteorito lo calizado no muniicpio de Varre-Sai, na região Noroeste do Estado do Rio de Janeiro. estimate of 31 km/s (I don't know how that speed was obtained). on his allsky camera in New Mexico, over 400 km to the south. Be sure to view the videos- the terminal explosion is very impressive. Learn about the importance of studying extraterrestrial molecules and meteorite components. 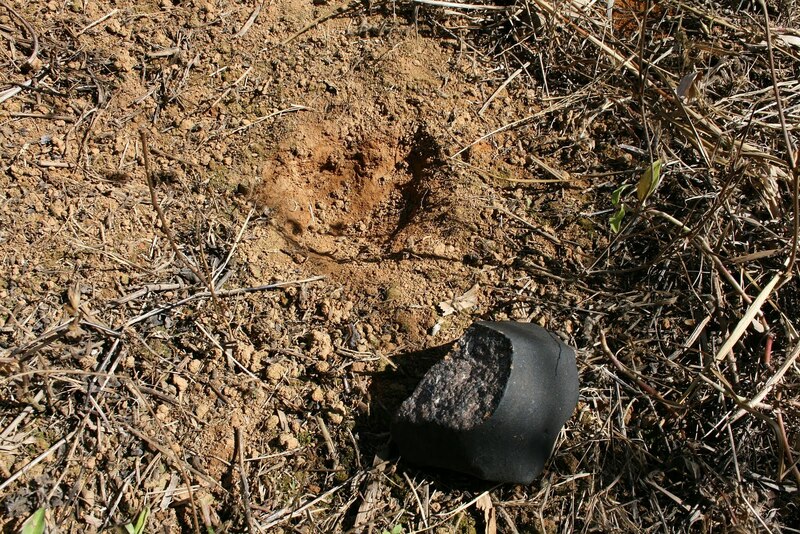 A ~600 gram meteorite fell about 15 meters from a ranch hand in Varre-Sai, Rio de Janeiro State, Brazil on June 19, 2010. 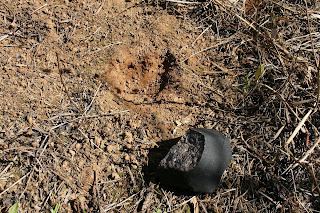 The images show the meteorite and how it was found (though it was picked up first, and then replaced for the TV camera). The person talking to the reporter is Prof. Marcelo Souza, Professor of Physics and Astronomy at the Universidade Estadual do Norte Fluminense, in Campos. The interview will be aired on Brazilian TV today. There is an interesting follow-up to the daylight meteor fireball in Brazil of June 19, 2010. 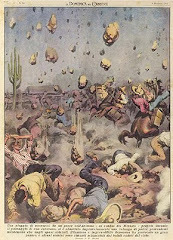 At about 21.00 UT, a ranch hand (name withheld) saw the fireball and heard explosions, after which something fell about 15 meters away from him in a pasture. 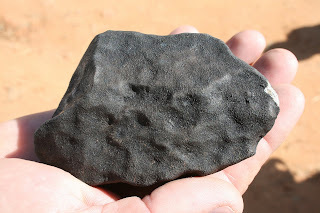 He walked over to the spot and picked up a 600 gram meteorite that had just fallen from the sky. He saw others fall at about the same time nearby but hasn't been able to find them yet. He commented that the air had a "strong smell of iron". The meteorite appears to be an ordinary chondrite with both primary and secondary fusion crust. I expect several more meteorites to be found from this fall based upon eyewitness reports. The local university and others will be joining the hunt today and in the coming days; stay tuned-in for more. A daytime fireball with sonic booms was reported by many people in Campos dos Goytacazes, Brazil on June 19 at about 21.00 UT. A local astronomy and physics professor, Prof. Marcelo Souza, was contacted by the fire department and others for explanation. Mammoth-Belch Deficit Caused Prehistoric Cooling? 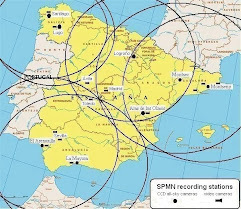 Are We Overlooking Alien Beacons? A daytime fireball with sonic booms reported by many people in Campos dos Goytacazes [Guaytocazes? ], Brazil at on June 19 at about 21.00 UT. A local astronomy expert was contacted by the fire department and others for explanation. No other information is available at this time. Source: Astronomers Without Borders- M.S. If you have any information please leave a comment. Thank you. Three days after the June 3 Jupiter "flash", the Hubble Space Telescope took a closer look at the site. It didn't find any trace of an impact leading. A meteorite expert says a strange ball of fire that landed in a Prince Edward Island farmer's field last Saturday was not from a meteor. ..
8 hours ago - The asteroid now called the Apophis was tracked by Russia and expected to come very close to being an Earth meteor on April 13th, 2029 and again in 2036. The exhibition is open from 1 June for three months. — A capsule thought to contain the first samples grabbed from the surface of an asteroid has returned to Earth. The Japanese Hayabusa container hit the top of the atmosphere just after 1350 GMT, producing a bright fireball over southern Australia. It had a shield to cope with the heat of re-entry and a parachute for the final drop to the ground. landed in the remote Australian outback. Do You Have a Moon Rock? 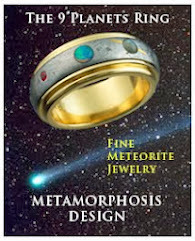 The June issue of Meteorite-Times is now up. A huge thank you to all the writers for their contribution of talent and time each month.